Hi everyone! 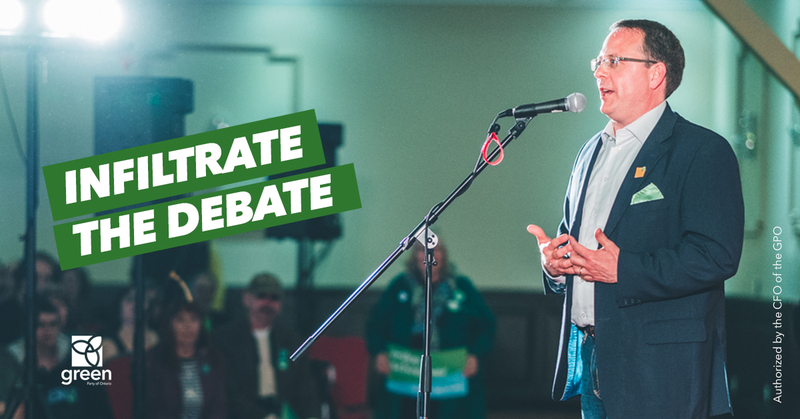 Want to see Mike Schreiner participate in the Leaders Debate tomorrow night? 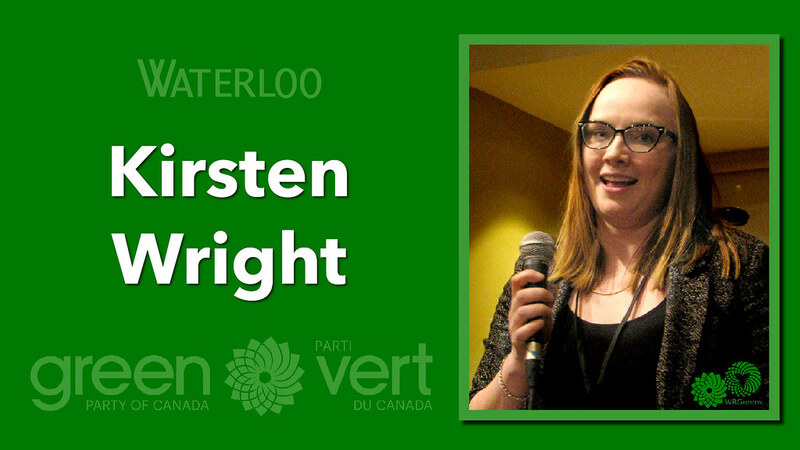 Join the Waterloo Region Greens at the Campaign Office for a watching party! Despite our best efforts, the unelected and unaccountable media consortium has continued with their decision to exclude the Greens from the televised Leaders Debates. Even though we are silenced, we must stay strong. We will keep pushing to get our Green voices heard, in all the ways we can. On Sunday, Mike Schreiner will ‘infiltrate the debate’ by hosting a viewing party and doing a live commentary of the televised Leaders Debate in his home riding of Guelph. The event will be livestreamed, so we hope you can all tune in to hear the real solutions Greens want to provide to the province. Join us at the WR Greens campaign office, perhaps bring a snack to share, and we’ll watch the Facebook live stream. Facebook Live: Mike Schreiner: I’ll be doing a live commentary of the (unfair) Leaders Debate. 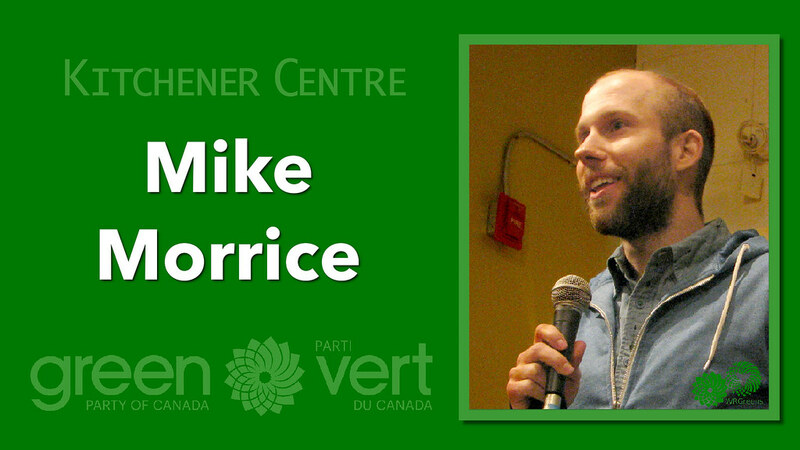 Mike has come to deliver the party’s platform to Waterloo Region. To get feedback from the community, Mike will host a round-table discussion on the topic: What changes do you need to do what you do? Community leaders and influencers are invited to participate in discussion groups on different issues that should be addressed by the provincial government. Mike and his policy team will take all notes and feedback from this session to learn about specific local solutions, whereas the platform will focus on provincial solutions. This meeting is open to everyone! Light snacks and refreshments will be served. 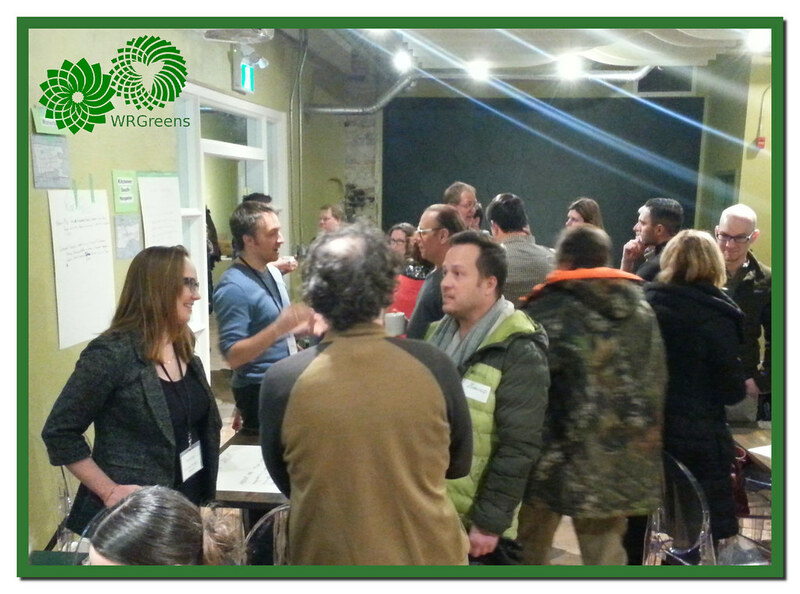 Join Mike and the WR Greens for a locally brewed beverage, a locally prepared meal or snack, and meet your local Green Party candidates and candidate-nominees from the five Waterloo Region ridings. The location has not yet been determined, but is sure to be one of the many craft breweries in the area. Mike has long been a champion to free the beer! Location is confirmed! Come meet Mike Schreiner and the Waterloo Region candidates and nominees at Abe Erb Restaurant and Brewery in Waterloo! 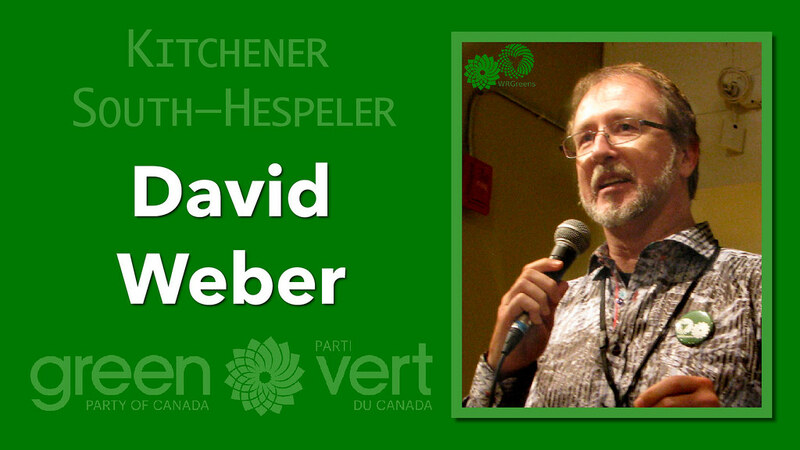 Donations towards the Green Party of Ontario election campaigns will be gratefully accepted at both events. 2017 (Green) Party in The Park! Whether you’re an official Green Party of Ontario member, a GPO supporter, or even if you’re just a thinker green thoughts, you’re invited to Riverside Park in Guelph for a (Green) Party In The Park. Anyone is welcome, even if you’re just curious about the Party that convinced the Government of Ontario to bump up the rates (from $3.71 per million litres to $53.71 per million litres) commercial watertakers like Nestlé pay for our municipal water. That’s still too little — it’s still only about a third of what we pay, but it’s a pretty impressive achievement for a party without a seat in the Legislative Assembly of Ontario. If Ontario wants better, we’ll need to start actually voting Green. 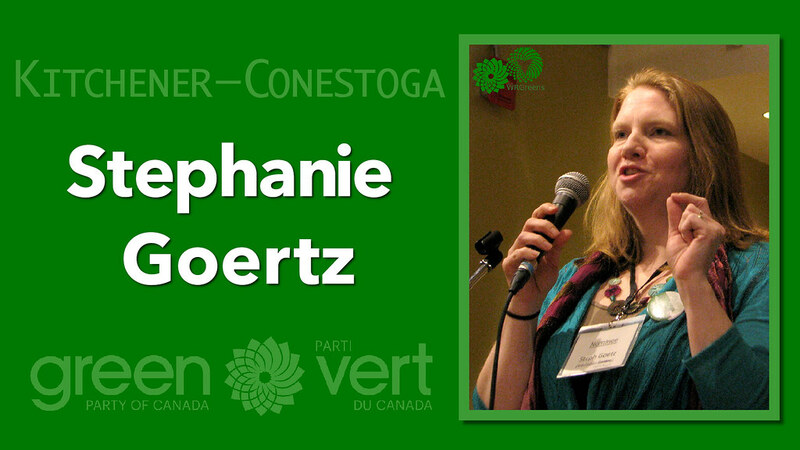 The official reason for the party is a Guelph Green Party of Ontario nomination meeting which will launch Mike Schreiner‘s bid to become the first Green Party member in Queen’s Park! Spread the word in your own neighbourhood! Did you know TWB is short for “Together We’re Bitter” ? 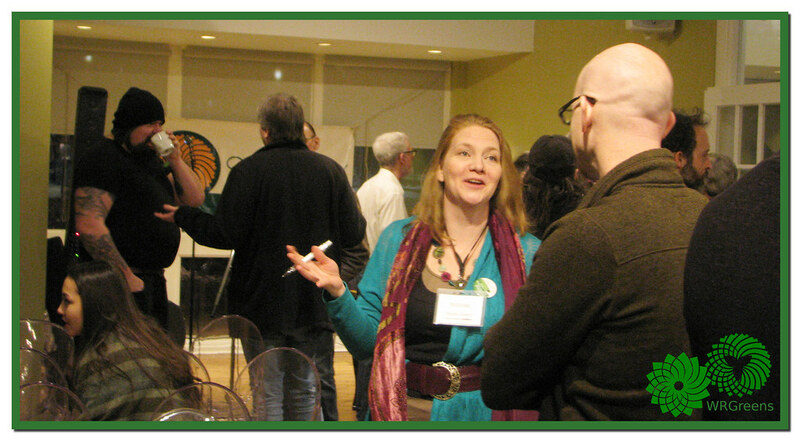 Join Green Party of Ontario leader Mike Schreiner for an evening out with your fellow Greens. A great chance to share your thoughts and discuss the local issues that matter to you. The evening will end with a no-holds-barred live interview about beer regulation hosted by local comedian Michael Masurkevitch (We Are Millennials). An added treat for those interested in looking behind the scenes at the TWB Brewery ~ for $5 you can get a ticket for a special tour of the Brewery from 7-7:30pm. The Wellington Water Watchers say the permit for Nestlé Waters in Aberfoyle, Ontario expired on July 31, but an automatic extension was granted without consulting local residents, and so continues to extract water from a local well even in the midst of a severe drought. “Although our permit expired on July 31, 2016, we have received confirmation from the MOECC that during this application phase, under the Ontario Waters Resources Act, Section 34.1 (6), the existing Permit to Take Water remains intact until the MOECC moves forward on a decision. We will continue to operate as usual…. Nestlé’s permits allow the company to take millions of litres each day. How much does water cost? There was a sale on Nestlé water at my local grocery store a few weeks back. 6 litres of water packaged in 12 plastic bottles for 99 cents. Twelve 500 ml bottles, that’s 6 litres of water. It works out to 16.5 cents per litre. That’s a pretty good deal, right? Until you consider what your water bill would look like if you had to pay 16.5 cents per litre. In Guelph the rate is $1.59 for a cubic metre of water.Footnote That’s works out to $0.00159 per litre for tap water at home. If it cost 16.5 cents a litre, a cubic metre of water would cost us $165.00. So, okay, it stands to reason, we’re paying a lot more for a bottle of water because companies are in business to make money. We’re paying extra for the convenience of getting that water in a bottle. Everything is relative. If Nestlé paid $1.59 for 1000 litres of tap water (like we do), then charged us 99 cents for it, the company would make a handsome profit. But it doesn’t. The reality is that citizens bear the cost of building and operating the infrastructure that supplies and treats water that Nestlé so profitably puts in bottles. “For every million litres of water, Ontario charges companies $3.71 after paying a permit fee of $750 for low or medium-risk water takings, or $3,000 for those considered high risk. To put it into perspective, while Nestlé pays $3.71 for every million litres of water, at $1.59 per cubic metre, the same amount of water would cost a Guelph citizen $1,590.00. “If customers are using less water, shouldn’t utility costs be decreasing and water rates going down? Maybe there is a time to subsidize a rich corporation’s pursuit of profit. If money were all that was at stake, maybe such an arrangement could be considered a good deal. Wellington Water Watchers also has serious concerns about Nestlés proposed expansion of its Ontario Water Taking operations. “Nestlé has issued a letter of intent to purchase a third well in Wellington County – the Middlebrook well, for an additional 1.6 million litres per day (300 gallons per minute). If Nestlé’s permit is approved for 1.6 million litres of water per day, the corporation will pay $3.71 per million litres (or $5.93 per day). Yet Nestlé confidently expects “that a new permit to take water will be issued to Nestlé Waters Canada by Ontario Ministry of Environment” for the Middlebrook site. We can get an idea of the scope of the problem by looking at the province’s interactive Map: Permits to take water. Seeing the water-taking locations linked to active permits across Ontario is an eye-opener. Ontario may be water-rich just now, but water is a finite resource. Every bottle of water shipped out of Ontario is another bottle of water that won’t make it back to our aquifers. “We will be requesting no more than a two year permit in Aberfoyle in order to assist a phase out of this permit and will also will be requesting no new well at Middlebrook. The WWW petition asking Ontario: Deny Nestlé Water-Taking Permit in Aberfoyle is nearing 100,000 signatures. Guelph City Councillor James Gordon will be bringing a motion to get city to advise the province not to renew Nestlé’s expired water taking permit in Aberfoyle. If you support Councillor James Gordon’s proposed motion regarding Nestlé’s permit to take water, you can come out to the Council meeting at 6:30 at Guelph City Hall (map) on September 26th, 2016. “The motion comes before a meeting of City Council’s planning meeting but won’t be debated until council’s regular meeting on Sept. 26. To add punctuation to the proceeding, a community gathering is being organized for Monday, Sept 26, around 5 – 6 pm, outside City Hall in support of to support James Gordon’s motion to honour and protect our watershed. Better stewardship of Ontario’s resources, including Water Taking has long been of concern for the Green Party of Ontario. That’s why the GPO has set up it’s own email writing tool to help Ontario residents make our feelings known to the Hon. Glen Murray, Ontario’s Environment Minister. You can use the letter provided edit it to better reflect your thoughts on the issue. Either way, it has been a long, hot summer filled with drought and water restrictions. Even if we can’t get to Guelph, we can speak up about our water supply. “In the small community of Aberfoyle just outside of Guelph, Nestlé is taking millions of litres of water to bottle, ship to other places and then sell back to us. “Worse yet, we are subsidizing Nestlé’s water taking. The Liberals set the water taking fee so low that it does not even cover the cost of administering the program. “Nestlé pays only $9.27 for the amount of water it would take to fill an Olympic-size swimming pool. You read that right. Nine dollars and twenty-seven cents. That’s just $3.71 per million litres. “Let’s tell the Minister of Environment to stop giving away our water.